Did you know that in the first draft of Roald Dahl’s Charlie and the Chocolate Factory, Charlie is encased in chocolate and given to another child as an Easter present? Or that the book's original title was Charlie's Chocolate Boy? Or that Dahl was working on a third book about Charlie at the time of his death? Here are some more fascinating facts about the development of this classic children’s book. 1. AS A BOY, DAHL WAS A TASTER FOR A CHOCOLATE COMPANY. 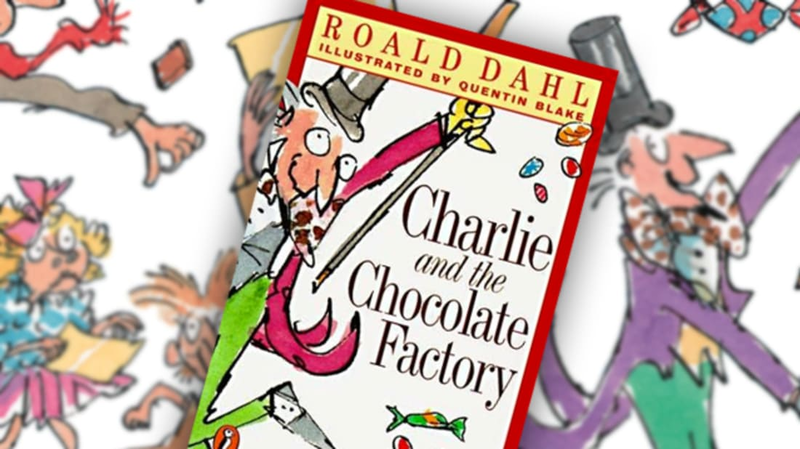 Dahl based Charlie and the Chocolate Factory on his experiences as a taster for Cadbury. When he was 13, Cadbury would send Dahl's school boxes of chocolates for the boys to taste test—kind of like an early focus group. The boxes contained 12 chocolate bars wrapped in foil—one “control” bar and 11 new flavors. As a child, Dahl fantasized about working in a chocolate inventing room, an idea that came back to him when he began writing his second children’s book. 2. CHOCOLATE ESPIONAGE WAS A REAL THING. The chocolate spies who try to steal Willy Wonka’s inventions for rival candy makers were not entirely a product of Dahl’s imagination. In the 1920s, competition among chocolatiers was so fierce that companies sent spies to steal each other’s innovations. Trade secrets were guarded and employees were monitored for suspicious activities. During Dahl’s childhood, the British candy firms Cadbury and Rowntree's became such vicious competitors that stories about their spying became the stuff of legend. 3. THE ORIGINAL TITLE WAS CHARLIE'S CHOCOLATE BOY. The first draft of the book, titled Charlie's Chocolate Boy, was completely different from the published version. In it, Charlie enters a room filled with chocolate eggs “the size of automobiles” and life-sized chocolate animals and people. He tries on a mold for making chocolate boys and becomes encased in chocolate. Willy Wonka, unaware that a real boy is inside the chocolate, gives Charlie to his son for Easter. Charlie then thwarts a robbery and Mr. Wonka rewards him with an enormous chocolate shop nine-stories high. 4. THERE WERE MANY OTHER KEY DIFFERENCES BETWEEN EARLY DRAFTS AND THE PUBLISHED BOOK. In addition to the familiar characters—Charlie Bucket, Augustus Gloop, Violet Beauregarde, Mike Teavee, and Veruca Salt—early drafts had a host of other characters and different parts of the chocolate factory. Originally, Dahl wanted at least twice as many kids to take a trip to Wonka's factory: The author's lost first draft may have had 15 children, according to a spokesperson from his literary estate, while later drafts (including the one read by Lucy Mangan for her book Inside Charlie's Chocolate Factory: The Complete Story of Willy Wonka, the Golden Ticket, and Roald Dahl's Most Famous Creation) put the number at 10 kids. In either case, Dahl quickly realized that was far too many characters and reduced the number to a more manageable five. In the years since the book's release, many of the cut chapters have been “rediscovered” among Dahl’s papers and published online. For example, there's a chapter in which Willy Wonka takes the kids into the Vanilla Fudge Room, which has “a colossal jagged mountain as high as a five-storey building, and the whole thing was made of pale-brown, creamy, vanilla fudge.” Two of the now-excised children, Wilbur Rice and Tommy Troutbeck, disobey Mr. Wonka and ride on the railway wagon straight into the Pounding And Cutting Room. (You can read the chapter here). 5. A CHARACTER NAMED MIRANDA PIKER WAS TURNED INTO PEANUT BRITTLE. Though Miranda was cut from the book, in 1973, Dahl published Miranda's chapter, called "Spotty Powder," as a short story in Puffin Post magazine. She and her parents try to smash the Spotty Powder machine and discover what the candy is really made of. 6. THE OOMPA-LOOMPAS WERE ALMOST CALLED WHIPPLE-SCRUMPETS. Dahl changed almost all of the character names except Charlie's. Along with the Whipple-Scrumpets, Violet Beauregarde’s original last name was Glockenberry, Veruca Salt was Elvira Entwhistle, Mike Teavee was Herpes Trout, and Augustus Gloop was Augustus Pottle. Willy Wonka was Mr. Ritchie until Dahl renamed him after a boomerang his brother Louis invented when they were kids. It was called a Skilly Wonka. 7. THE OOMPA-LOOMPAS WERE FIRST DEPICTED AS AFRICAN PYGMIES. 8. DAHL EXPERIENCED TWO MAJOR TRAGEDIES WHILE WRITING CHARLIE AND THE CHOCOLATE FACTORY. While writing the book, Dahl experienced two of the biggest tragedies of his life: The first occurred in 1960, when a taxi hit his son Theo, who was riding in a baby carriage. The child developed hydrocephalus, a build-up of fluid in his brain cavities that led to high fevers and temporary blindness and required that the young boy be put through a series of operations. Not content to sit by idly and watch his child suffer, Dahl became an active participant in Theo's recovery. With the help of toymaker Stanley Wade and Theo’s neurosurgeon, Kenneth Till, the trio developed a shunt that helped to alleviate the condition. It became known as the Wade-Dahl-Till valve. 9. THE MOVIE WAS A BOX OFFICE FLOP. 10. THERE'S A REASON WHY THE MOVIE STARS WILLY WONKA. 11. THERE WAS GOING TO BE A THIRD CHARLIE BOOK. The book’s sequel, Charlie and the Great Glass Elevator, was released in 1972. Dahl was working on a third book titled Charlie in the White House when he died in 1990. It was never completed. 12. CHARLIE AND THE CHOCOLATE FACTORY CONTINUES TO INSPIRE OTHER ENTERTAINMENT. Aside from the two movies, Charlie and the Chocolate Factory has been adapted into a musical, an opera, and two video games (including a 1985 game by ZX Spectrum). There’s even a Charlie and the Chocolate Factory ride at the Alton Towers theme park in the U.K. And let’s not forget the band Veruca Salt, named after the spoiled little girl who’s labeled a “bad nut” and sent down a garbage chute by Willy Wonka’s trained squirrels.